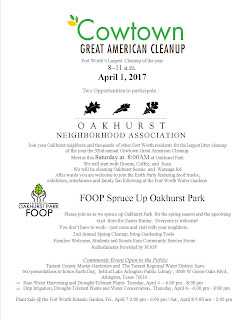 Oakhurst Neighborhood Association, Fort Worth, Texas: This Weekend: Cowtown Great American Cleanup and Spruce Up Oakhurst Park! This Weekend: Cowtown Great American Cleanup and Spruce Up Oakhurst Park! Oakhurst neighbors, you have two opportunities to participate in beautifying your neighborhood tomorrow! Oakhurst Neighborhood Association (ONA) will be participating in the 32nd annual Cowtown Great American Cleanup. Meet up at 8 am tomorrow (Saturday) at Oakhurst Park for donuts, coffee, and juice. Then we'll clean up along Oakhurst Scenic Drive and Watauga Road. Afterwards, you are welcome to join fellow residents from across Fort Worth for the Earth Party at the Fort Worth Water Gardens. 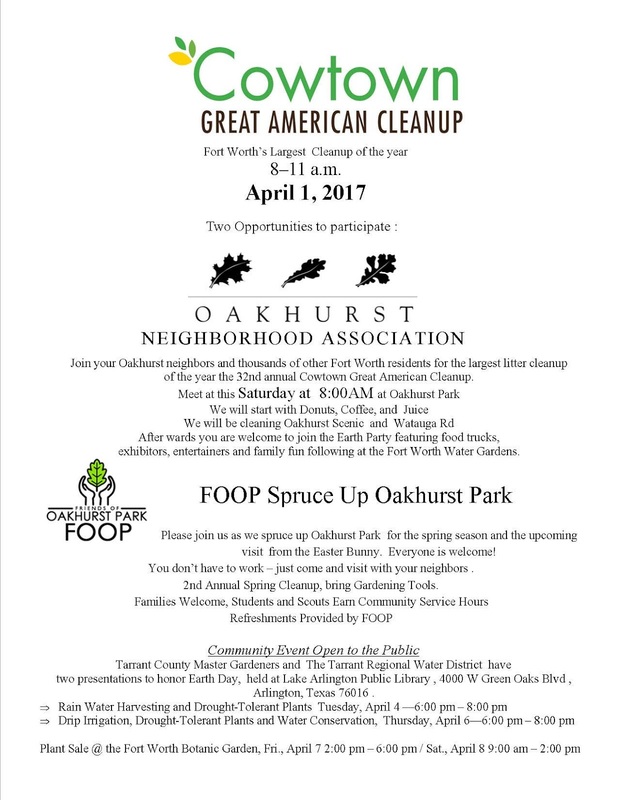 Friends of Oakhurst Park (FOOP) will be hosting its 2nd spring cleanup event at Oakhurst Park. Refreshments will be provided. Bring your gardening tools or just come out and visit with your neighbors! Click on the flyer image above for more details, including upcoming events and a plant sale!